To encourage research in, and awareness of, the history of the Town of Digby and Digby County through the Admiral Digby Museum. The mandate of an organization delineates the disciplines, fields of specialization, geographic area and chronological period for which an institution will be responsible. 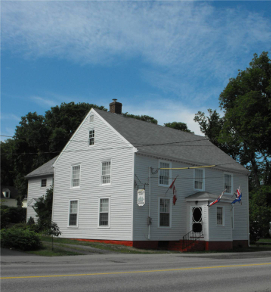 The mandate of the Admiral Digby Library & Historical Society is to oversee the Admiral Digby Museum. To enrich community knowledge and awareness of the history, heritage and culture of the Town of Digby and Digby County. The mandate of the Admiral Digby Museum is to study, preserve and make available to the public the history of the Town of Digby and Digby County. The Admiral Digby Museum, a Georgian-style home, was constructed in the mid 1800’s. One of the oldest structures in the Town of Digby, it is named in the honour of Rear Admiral Robert Digby. Upon visiting, you may notice some walls are made of lath and horsehair plaster and the doorways are very low. This tells us that the people of yesteryear were shorter than their descendants! On two floors, period rooms contain furnishings and artifacts relating to the heritage of Digby Town and County. Of interest on the first floor in the Parlour are an 1870’s organ, 1909 Edison Phonograph and a melodeon (1840-1870) and an 1890’s hand-crafted grandfather clock. Our Marine Room displays ship models, navigational equipment and photographs. The second floor displays vintage clothing in our Costume Room, while the Loyalist Room displays documents, ledgers, artifacts, and more. While in Town, if you have roots to Digby County, visit our Genealogy Research Department. The building served as the Admiral Digby Library during the 1970s. It was operated by the Admiral Digby Library Association. In 1972, the Society’s name was officially changed to the Admiral Digby Library & Historical Society, of which operates the Admiral Digby Museum. As with most non-profit organizations, the Society relies heavily on the generosity of people like you. We welcome donations and, upon request, provide receipts for donations of $10 or greater.